Unfiltered has become such an unexpected favorite of mine. 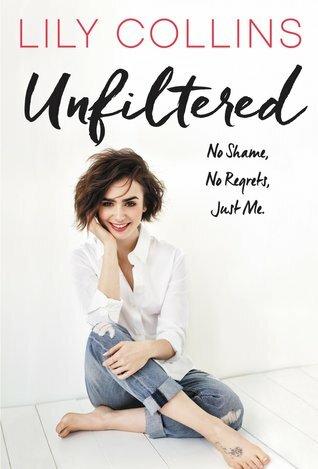 I wasn’t very familiar with Lily Collins prior to reading this book but now I’m such a fan of hers. Lily is very open and honest in Unfiltered and I really appreciate how sincere she is. I was able to relate to her a lot and she also showed me a few new perspectives on things. Lily talks very openly about her past with eating disorders and I think her story can be very empowering to others who have/are struggling with that disorder and are looking for representation and a voice. I really loved how Lily talked about normal, everyday things that happen to many people and put an inspirational spin on it. She talks about a few situations she’s dealt with when it comes to her dating life and I really liked how she gave advice after her stories through out the book. Overall, I really loved Unfiltered and I highly recommend it if you’re looking for a quick non-fiction read. I think this would be especially great for young girls because Lily is such an inspirational, classy role model.